Mateusz Moolhuizen opened from middle position to 25,000. Carmen Zainescu, who won the #QueenRules Ladies Event yesterday, called from the big blind. Moolhuizen fired out a continuation bet of 20,000 on the :::4s:::4d:::qs flop after Zainescu checked. Zainescu check-called again, this time for 45,000 after the :::kc came on the turn. The :::3s completed the board on the river and Zainescu checked again. 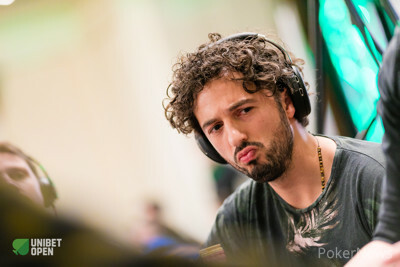 Moolhuizen jammed his remaining stack of 90,000 and Zainescu tanked for a few minutes. She eventually made the call and Moolhuizen sheepishly showed he had :::jc:::tc. Meanwhile, a second later Zainescu turned over :::Ah:::5s and screamed in delight when her ace-high hero call was good. "Good for her," Moolhuizen said with a smile as he headed to collect the 35th place prize of €3,480.